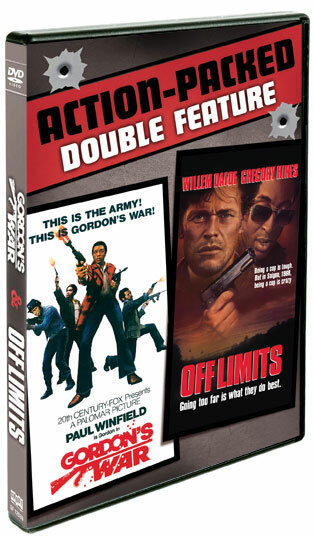 Digi-Schlock: OFF LIMITS/GORDON’S WAR (Shout! Factory 2-For-1 DVD) – Schlockmania! Shout! Factory’s line of double feature discs have become a really nice value for budget-conscious movie fans. 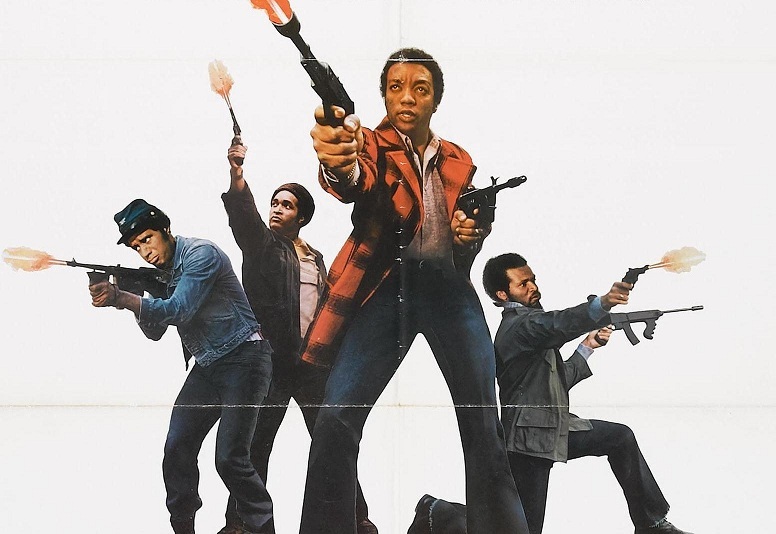 This pairing of Off Limits and Gordon’s War is a bit loose thematically – simply put, the only connections are both feature black actors in lead roles and the Vietnam War as an element of the plot – but it’s a typically reliable set in terms of both image quality and supplements. Both films are presented in anamorphic 1.78:1 transfers – each looks suitably vibrant in terms of color and the level of detail was solid on both titles. Surprisingly, it’s the older title – Gordon’s War – that looks the best. The audio is 2.0 Dolby Digital on both films and each sounds good. There are also a few extras included on each film. 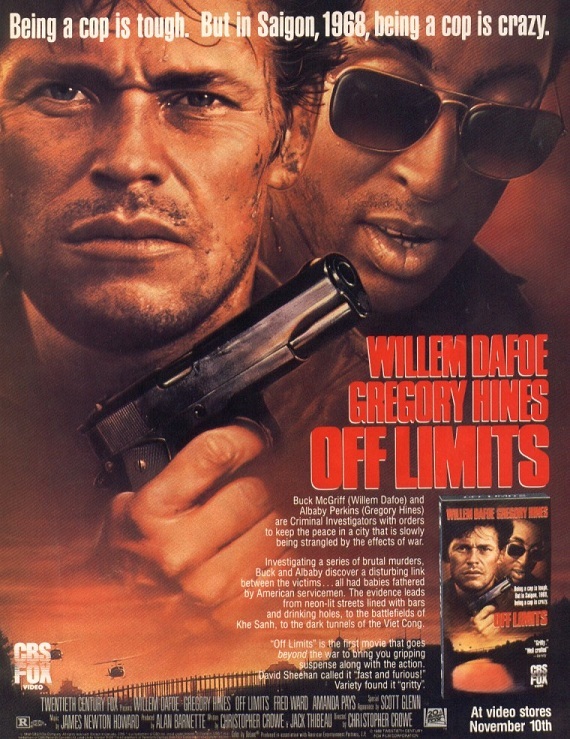 Off Limits has a commentary track featuring director Christopher Crowe and star Willem Dafoe. It’s a steadily-paced track that has both men offering a reasonable amount of detail about the film’s history. Both talk a lot about the practical challenges of shooting in Thailand and Crowe gets into really interesting territory later on about how the studio tried to force him into making a “buddy cop” flick out of his film. Dafoe mainly plays a supportive role on the commentary but has his moments, like when he notes which shots came from a reshoot by pointing out how his hair is different in those shots. It’s not a revelatory track but offers a few worthwhile nuggets of trivia for the film’s fans. Gordon’s War gets a bit more in terms of extras, offering a commentary track as well as a few trailers. The commentary pairs actor Tony King with cinematographer Victor Kemper and they offer a relaxed but steady stream of comments about the film. The most interesting bit they reveal is how the film got location access and security by employing the Black Muslims in Harlem to work on the shoot. Like the Off Limits commentary, it’s not mindblowing stuff but there’s enough worthwhile moments to appeal to fans. The trailers included for Gordon’s War also offer a bit of fun. There are two t.v. spots and one theatrical trailer (all presented full-frame) and they’re classic blaxploitation trailers, right down to the hip narration (“It’s war, baby… Gordon’s War!”). All in all, it’s another solid catalog title from Shout Factory. The main criticism here would be that the connection between the two films is too loose for it to work as a genuine double feature. Chances are, most people will be buying this for Gordon’s War and they probably would have liked to see another blaxploitation flick paired up with it. That said, the disc offers plenty of value for a cheap list so price so fans of either film will find it worthwhile.